Once again Sir Dayvid of Oxfordshire reminds us of how small our world really is and that England and America share much in common, especially when it comes to beer drinking scoundrels and those fortunate enought to live life to the fullest. "Sir Hook. It seems the scion of my relatives from the Carr family... that got washed up on your shores...were not just content to get shot for throwing snowballs at the Redcoats in Boston, but instead got on their horses and rode West and made a bit of that thar gold in them there hills. Records show that one of the Carpetbaggers made it as far as Cripple Creek, Wyoming where he appears in records to be partners with a guy called Kuykendall and became a Stockmen, owning vast tracts of land, ranches and cattle in 1884, even having their own cattle brand that I have found in an old book of Western Cattle Brands in a second hand bookshop. 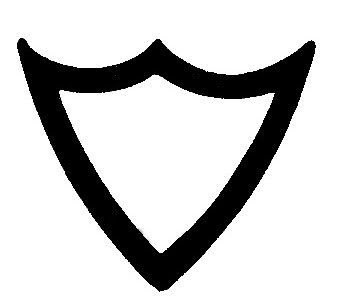 Remarkably it seems that old habits die hard and Carr decided to use the shape of a shield as his brand to mark all his cattle. Kuykendall and Carr became so rich that they started a transportation firm of stagecoaches, and when the railroad came overland to California they not only purchased track but sold huge amounts of their land for use by the railroads. Americas short history is a mighty landscape to search through. Ride em Cowboy!" I remember reading once where Daniel Boone would pack up and headed west whenever he could see the smoke from a far-distant cabin. I guess riches to him was, in part, solitude. He got as far as Missouri. Later, others moved West (from sea to shining sea) for open spaces and profits!